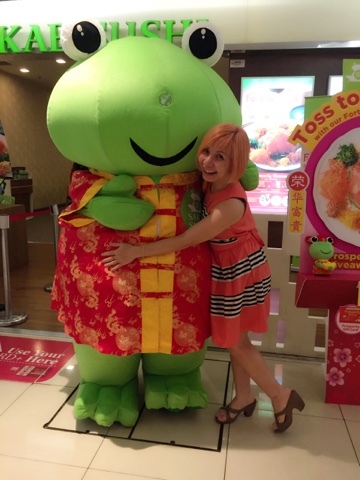 Hey.... Gong Xi Fa Cai from Sakae Sushi's iconic green frog and me! 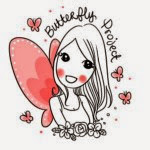 :p Sakae Sushi, popular for its kaiten sushi-concept with over 32 outlets in Malaysia offering a delectable variety of quality Japanese specialties including sushi, sashimi, yakimono and many more. It was another early lou sang and catching up with my foodie blogger friends. 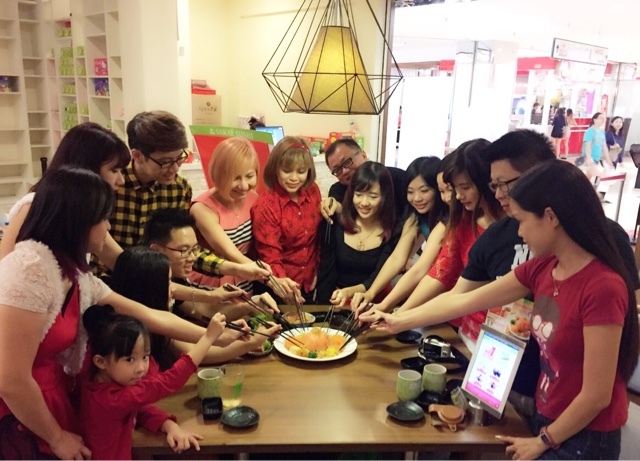 What better way to celebrate this prosperous and joyous occasion than to bond over a hearty meal at Sakae Sushi? 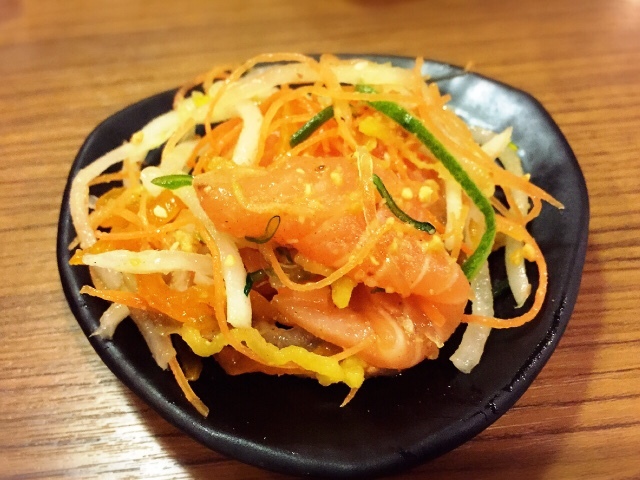 Luscious and thick slices of fresh airflown salmon. Taking a break from the traditional Yee Sang dish, this tantalizing Japanese-inspired Yee Sang served with a variety of authentic Japanese ingredients such as seasoned jellyfish, mekabu seaweed, Japanese cucumber, sesame and more truly impressed me. What's more when it's topped with a unique and appetising citrus-infused sauce, perfectly complement with the freshest ingredients to bring out the flavours of Yee Sang. 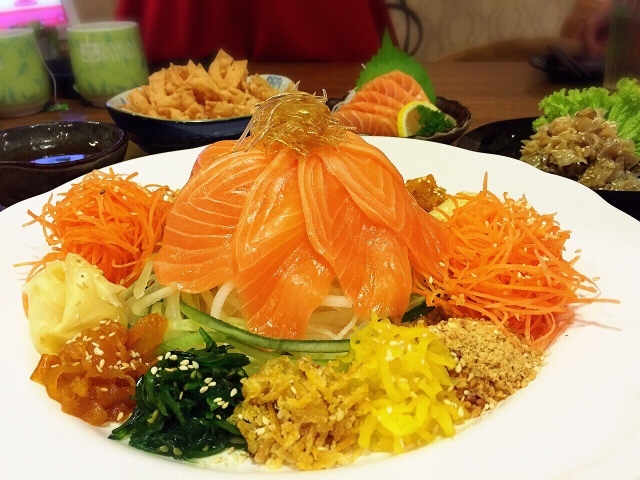 One of the best Yee Sang I've had especially when we add on more Salmon and Jellyfish! 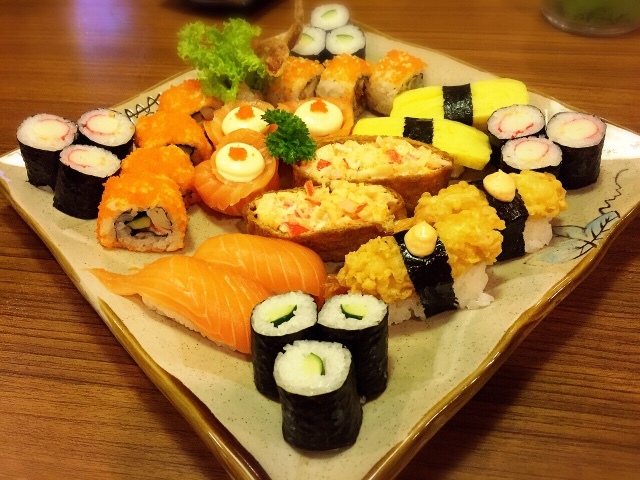 Specially handcrafted by Sakae's master chefs featuring Sakae's all time favourite sushi selections such as Hana Maki, California Hoso Maki, Salmon Sushi, Tamago Sushi, Soft Shell Crab Maki, Kani Salad Inari, Mini Ebi Tempura Sushi, Kappa Maki and Kani Maki. 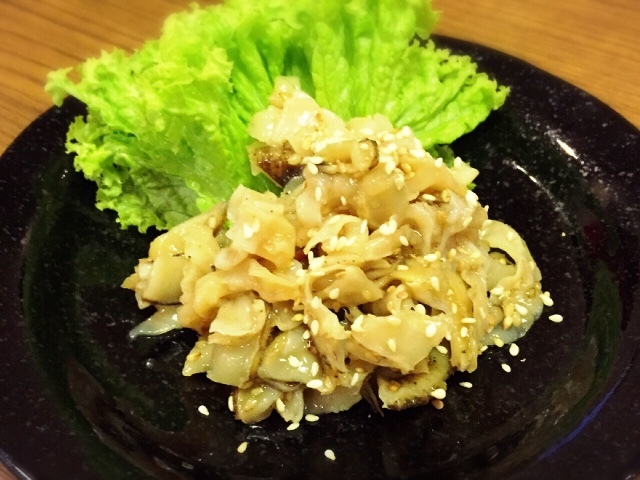 Available for Happiness Treasure Combo that includes Money Yee Sang. 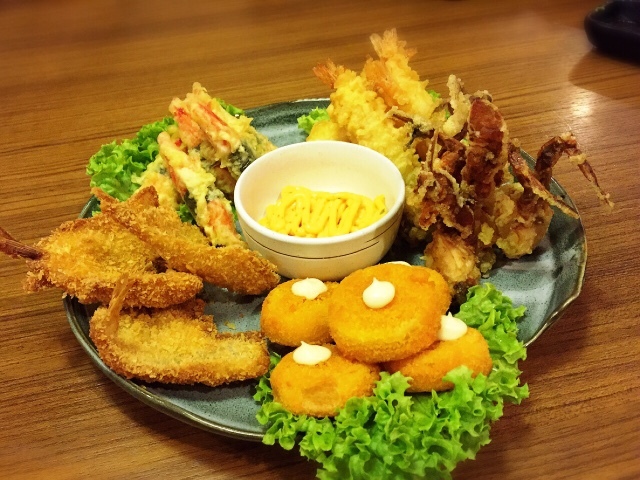 Lavish platter for more prosperous consists of five must-try golden offerings like Soft Shell Crab, Mini Ebi Tempura, Itoyoridai Katsu, Fried Hotate and Fried Kani served with a spicy mayonnaise. 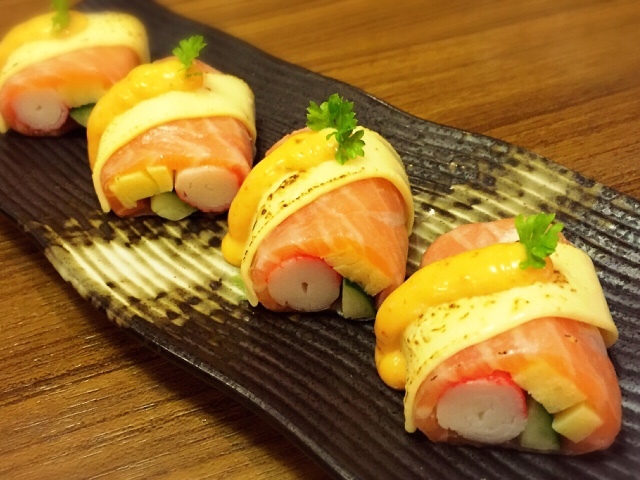 The savoury goodness of delectable rolls with salmon, crabstick, Japanese omelette and Japanese cucumber topped off with cheese and spicy mayo. 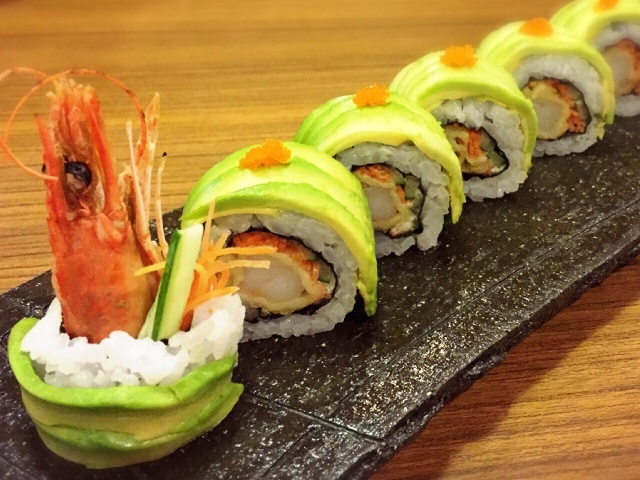 Maki creation of crisp and succulent golden tempura prawn layered with fresh avocado slices and shrimp roe. 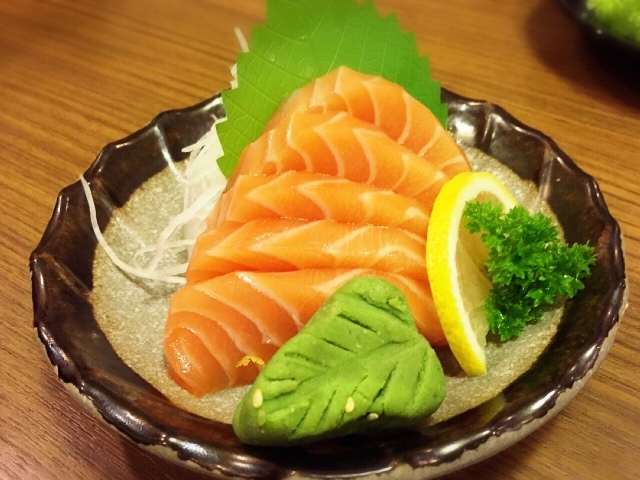 One of my favourite and must order every time I visit Sakae. 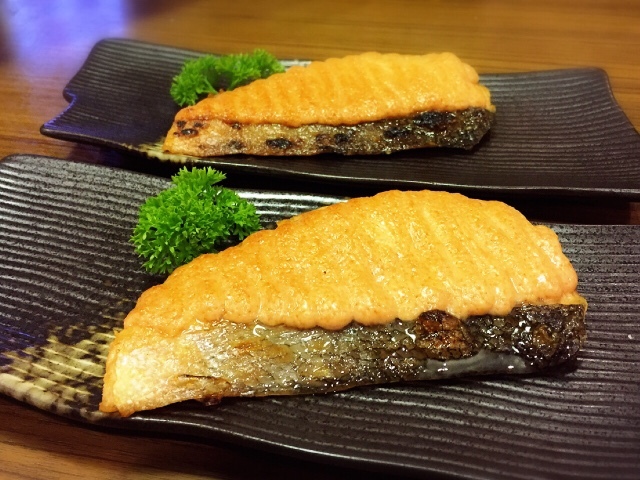 Perfectly grilled salmon with cod fish roe. Superb! 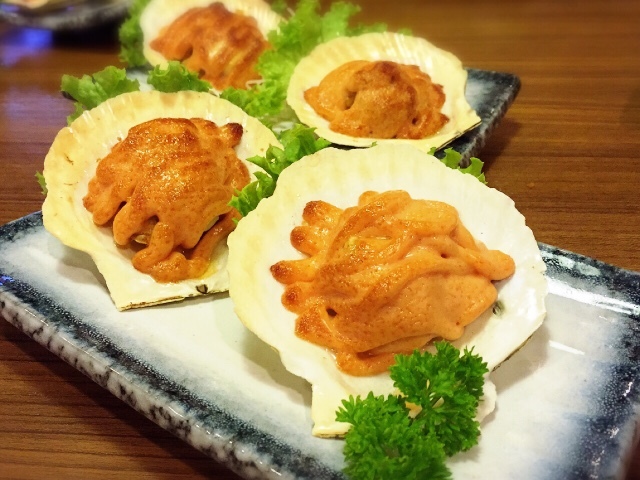 Love the succulent half shell scallops grilled with cod fish roe. 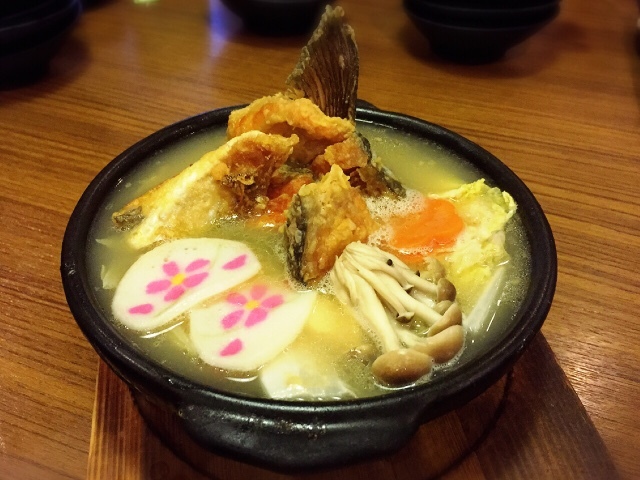 For soup lovers, try this hearty Japanese-style hotpot with succulent salmon head, assorted mushroom and vegetables in flavoursome broth. 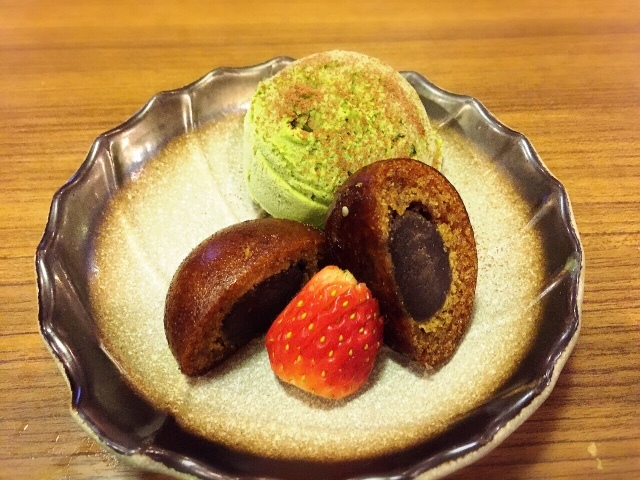 Traditional Japanese deep-fried bun with red bean paste filling come with a scoop of creamy green tea ice cream. 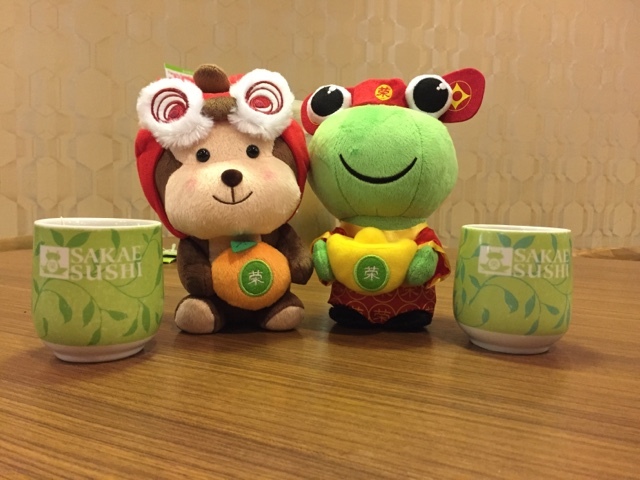 In conjunction with the Year of the Monkey, Sakae is pleased to introduce their limited edition adorable plush toys - Fortune Rong Rong which symbolises prosperity while Lucky Mon Mon means full of happiness. With the all-new Prosperity Giveaway, diners will receive a special reward with just a minimum purchase of RM80. 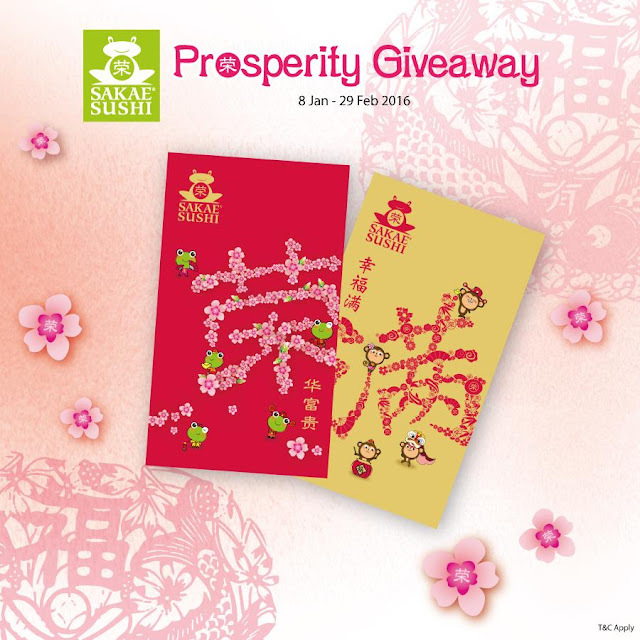 This includes exclusive and attractively designed Sakae Limited Edition Angpows, RM8 prosperity voucher and a Prosperity Gift Card. 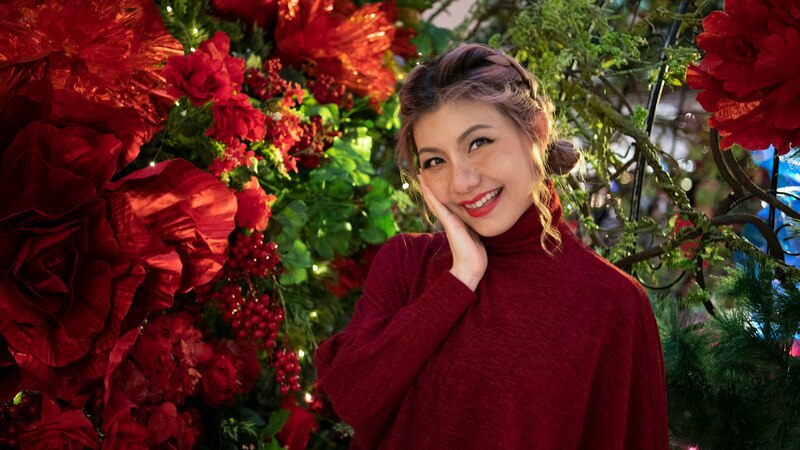 Some of the prizes include a set of limited edition, Fortune Rong Rong & Lucky Mon Mon plush toys or free foods vouchers or Sakae cash vouchers. 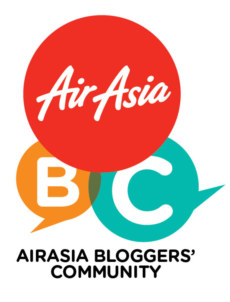 Last but not least, don't forget to participate in the Pose for Prosperity contest from 18 January till 29 February 2016. 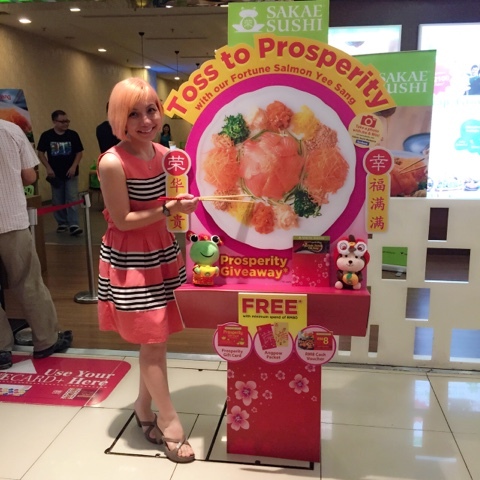 Just snap a creative pose with the 'Toss to Prosperity' Yee Sang standee located in front of Sakae Sushi outlets, upload it to comment section of Sakae Sushi Malaysia's Facebook contest post and the most creative photo stands a chance to win attractive cash prizes and more.